What if The Little Mermaid was about a mermaid who wants to snuggle with cats? 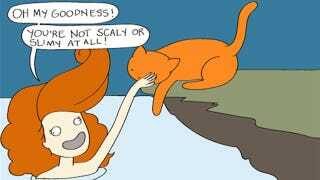 Cats rule their humans in Yasmine Surovec's crazy-eyed webcomic Cat vs. Human, and it seems mermaids are not immune to their aloof charms. In her retelling of The Little Mermaid, a young mermaid wants to pet a cat and seeks the aid of the Sea Witch to become a cat cuddling human. Naturally, it doesn't go well. You can read the first few pages of the Cat vs. Human Little Mermaid below and the rest at the comic's site. If you're a cat lover, give Cat vs. Human a gander. You might find it rings a bit uncomfortably true.